Within the scope of the collaborative research project “FeAl-GuD”, which is funded by the Federal Ministry for Economic Affairs and Energy (BMWi), an intermetallic phase of iron and aluminium (FeAl) should be made available for power plant technology. Iron aluminides besides titanium aluminides belong to the most important intermetallic materials with high application potential as high-temperature materials. B&B-AGEMA is focused on the aerodynamic and structural design of turbine bladings made of iron aluminides. Combined cycle power plants (CCPP) optimally suite the task of grid stabilisation in terms of the electricity supply as part of the planned expansion of the renewable energies. CCPPs are characterised by short start-up and shutdown times, fast load changes and a comparatively high efficiency. The last gas turbine stages usually are manufactured from nickel-base alloys and the first stages of high and intermediate pressure steam turbines mainly are made of high-alloyed heat-resistant steels. The application of an intermetallic phase of iron and aluminium (FeAl) yields the possibility for closing the gap in terms of the operating temperature among heat-resistant steels (operating temperature up to approx. 620 °C) and nickel-base alloys (operating temperature from approx. 700 °C). This enables an enhanced thermodynamic process control in CCPPs by increasing the gas turbine outlet temperature and the corresponding live steam temperature of the bottoming cycle. Hereby, the thermal process efficiency can be further improved whilst achieving a target quantity of 65 %. Lower density and improved material properties of FeAl enable shortened start-up and shutdown times of gas and steam turbines in contrast to the established materials as used in turbomachinery. The operational flexibility of CCPPs should be improved based on lowered moving masses by usage of FeAl. Another project objective of B&B-AGEMA is the increase of aerodynamic turbine efficiency as a result of further development of flow-optimised blading geometry with reduced gap and secondary flow losses for outlet blading of the gas turbine and inlet blading of the steam turbine in consideration of the service possibilities of the new material. After casting iron aluminides develop a coarse grain structure during solidification, which results in a low ductility and an increased susceptibility to cracking. On this account the casting process for the FeAl intermetallic compound should be improved by insertion of nucleation agents in the melt and a fine grain structure is expected. This will reduce the susceptibility to cracking and increase the room temperature ductility. Finally the mechanical behavior of the newly, grain refined FeAl material will be analysed and a database with the relevant material properties of low and high cycle fatigue (LCF / HCF), thermomechanical fatigue (TMF) and creep and oxidation properties will be established. 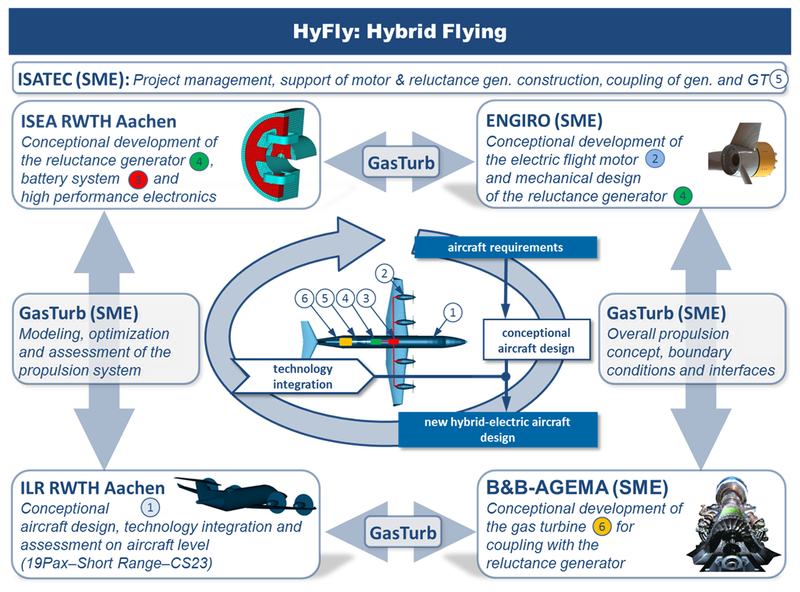 The overall goal of the HyFly project is the conceptual development of a hybrid electric propulsion system for the integration into a regional aircraft. It is intended to significantly contribute to the objective of reducing emissions with respect to pollutants and noise in aviation as defined in the European aviation vision “Flightpath 2050”. This should be achieved by using hybrid drive architecture. The thrust is provided by electric motors. During the relatively short starting phase of the aircraft, which is most demanding for the power system, the engines are assisted by a battery. During cruise, the power is supplied by a reluctance generator, driven by a special gas turbine. B&B-AGEMA focuses on the conceptual design of the gas turbine intended to drive the reluctance generator as well as the development of software for analysis of the operation and prediction of the long-term behavior of the GT. Due to the scalability of electric motors without internal loss in efficiency, it is possible to design new aircraft configurations with small span-spread, electrically driven propellers. This allows more efficient wing designs. The drive system to be developed within the present project will feature distributed purely electric drives with a bivalent power supply; consisting of a battery pack and a gas turbine with a directly coupled reluctance generator. This propulsion concept envisages that the high power required during the relatively short starting phase of the hybrid aircraft is provided by an on-board battery, which can be charged on the ground with electric energy obtained from renewable sources. During cruise, the aircraft's propulsion system is powered solely by an on-board turbine generator system. 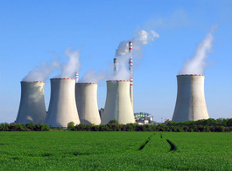 Accordingly, the objective of reducing emissions is achieved in two ways: On the one hand, the portion of energy to be extracted from fossil fuels is reduced by the amount that can be provided via renewable electricity; on the other hand, an eminently high efficiency can be reached for the gas turbine, since cyclic loading is not required. The operation of the GT at an optimized, very constant base load point allows the reduction of the fuel consumption and emissions. One focus of the planned project is on the conceptual development of an in-flight power unit consisting of a high-performance reluctance generator and a gas turbine. It is characterized by the first time use of a switched reluctance machine for power generation for aircraft application. This type of generator operates very efficiently – especially at high rotational speeds – which is ideal for coupling to a gas turbine of the required power class. The battery-electric system supports the take-off phase and compensates quick load adjustment requirements. This reduces the rated output of the gas turbine compared to conventional drives and allows operation of the GT a constant turbine inlet temperatures and rotation speed. Extreme operating points and high mechanical and thermal stresses can be avoided. 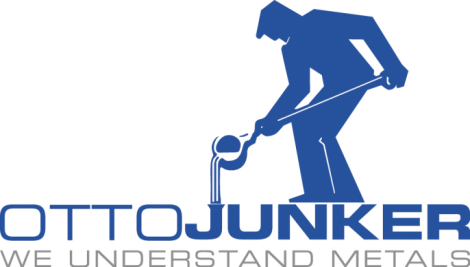 Thus, maintenance intervals can be extended and the overall life-time costs of the GT, reduced. The generated power is delivered to e-aircraft engines, whose predevelopment according to the requirements of the overall system analysis is also part of the project. With the system components to be examined, new aircraft and propulsion concepts can be realized. The parallel integration of the models derived from the development of the new propulsion system components into the MICADO aircraft preliminary design environment, makes it possible on the one hand to design aircraft concepts with this propulsion system and to evaluate their operating costs, performance and eco-efficiency compared to existing reference aircraft. 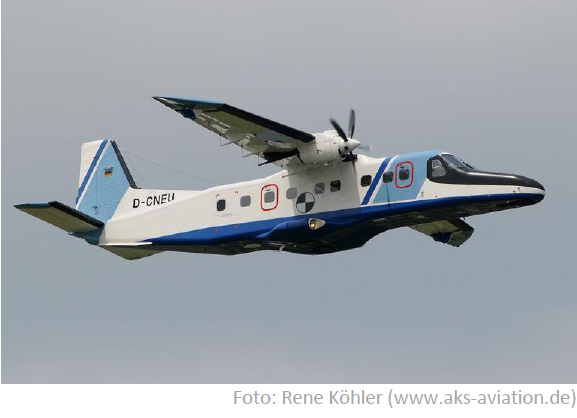 In the project HyFly a Dornier Do228-212 is examined. As a result, it should also be possible to prove the development success and the potential of hybrid-electric powered regional aircraft. The collaborative research Project "Permit" has been performed in collaboration with Micro Turbine Technology (MTT), Leuven Air Bearings and B&B-AGEMA and has been funded within the INTERREG program. B&B-AGEMA investigated the heat management of the turbine and bearing assembly of the micro turbine ( the "hot part" of the micro turbine) by application of the conjugate heat transfer method, a numerical method to determine the material temperature distribution with simultaneous determination of the internal fluid flow fields and their mutual interactions. 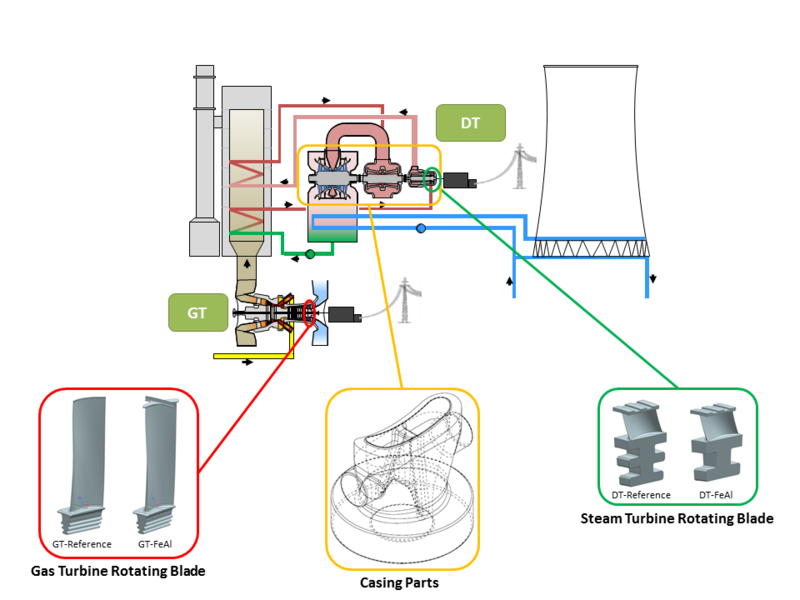 Based on the complex simulation model the heat flow through several components of the turbine assembly and the influences of different flows could be evaluated and the results could be used for optimization of the heat management and thus, for performance enhancement of the turbine.